A blast wrought destruction upon a busy night market in the city of Davao in the Philippines, the hometown of the recently-elected President Rodrigo Duterte. Varied casualty tolls have been reported as the number of victims has risen. At least 12 are dead and 60 are injured, according to officials. 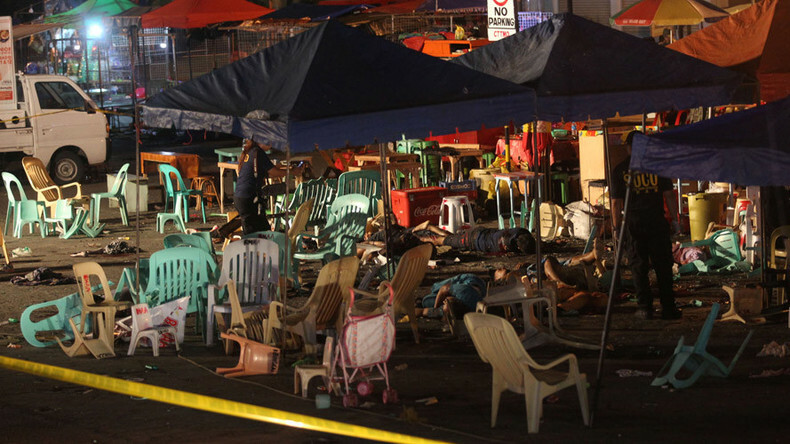 The blast occurred at about 10:20pm local time, in the massage parlor area of the Roxas Night Market, a hotspot in the city of 1.6 million people, and near the upmarket Marco Polo hotel. Eyewitnesses have reported a single loud blast, followed by billowing smoke. Ambulances arrived at the chaotic scene within minutes. Police say that the explosive was a homemade device, filled with shrapnel. “Rest assured the authorities are on top of this incident. Right now, we cannot yet give a definite answer as to who is behind this,” said Paolo Duterte, vice mayor of Davao and son of the current president. Davao Police Spokes Milgrace Driz says 25 casualties brought to Southern Philippine Medical Center (SPMC) after explosion in Roxas St.
President Duterte was due to customarily fly into the city for the weekend around the time of the blast, and has often visited the Marco Polo Hotel, but was not near the site of the explosion when the explosion rang out. He spent the next several hours at a nearby police station. Duterte, who has gained notoriety for his violent war on drugs, was recently targeted in an assassination plot, according to Philippines police. Tens of thousands of the country’s citizens have died in recent decades at the hands of militant far-left, Muslim, and ethnic minority groups. Although it is considered a relatively safe city, Davao is located on the island of Mindanao, the heart of the separatist movement of the Moro people, who espouse Islam. Duterte has promised to reach a diplomatic compromise with the movement, but has also threatened retribution against those forces who use violence.